This block is used to pull cable toward or away from corner poles and any other location where a single block is required. Designed to handle the higher stresses encountered when pulling a 1-1/2 to 3 in. (38-76mm) cable around corners at a pole. Positive clamping mechanism securely latches onto the strand, allowing the sheave to tilt with the load without prematurely releasing. 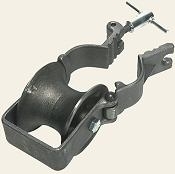 The sheave is enclosed in a forged, hinged steel frame. Has a 5000 lb. (2268kg) load capacity rating.